Researchers track sea turtles’ migration away from N.E. A leatherback sea turtle surfaces for a breath. 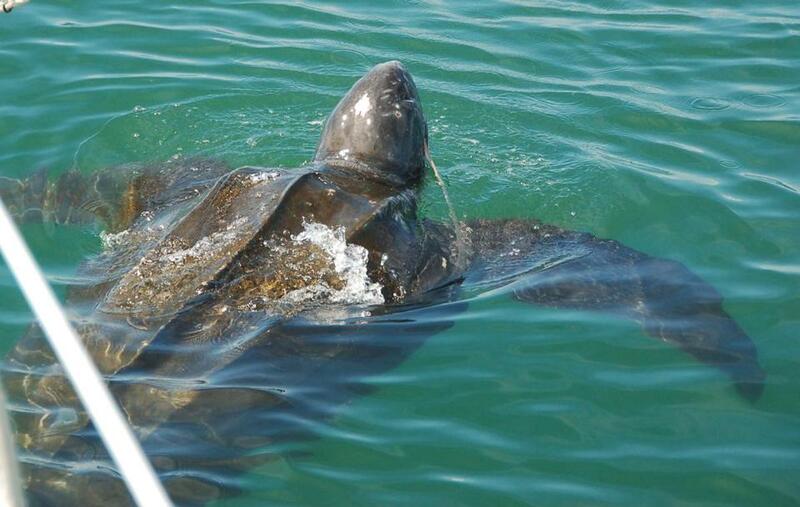 They are among New England’s most mysterious summertime residents: giant leatherback sea turtles that swim thousands of miles each year to take up residence off our shores and dine on jellyfish. For years, people have known that leatherback turtles that weigh as much as 800 pounds make occasional forays into New England waters, but a four-year tagging project has for the first time given scientists a detailed look at their wanderings through the Atlantic Ocean. In a paper published Wednesday in the Proceedings of the Royal Society B, researchers describe the travel patterns of 15 turtles that summered in New England and then fled in winter. From different starting spots, they traveled in the same southeast direction for hundreds of miles, almost like swimmers in their own lanes with each moving parallel to one another in a vast pool. “They all departed the coast and went straight out in the middle of the ocean, which surprised us because you’d think it would make sense to travel a more coastal route,” said Kara Dodge, a postdoctoral researcher with the National Oceanic and Atmospheric Administration in Woods Hole who led the research. Although the researchers can’t tell how the turtles manage this extraordinary navigational feat out in the open ocean, they were able to rule out many factors. The large reptiles aren’t likely to be taking their cues from sea currents or odor, for example. The most likely scenario, the researchers believe, is some combination of navigation by the sun’s position and the earth’s magnetic field. The new finding is the latest result to emerge from an unusual study of leatherbacks that Dodge has been conducting with Molly Lutcavage, a fisheries ecologist and director of the Large Pelagics Research Center at the University of Massachusetts at Amherst. Because of the logistical difficulty of finding, capturing, and tagging the large creatures, few research groups have studied the adult turtles, which are rated “vulnerable” by the International Union for Conservation of Nature. Leatherbacks are divided into subpopulations that feed in different parts of the world’s oceans. Initially, the researchers were fascinated to learn that this group wasn’t just passing through — they stayed, spending two to three months gulping down jellyfish off the New England coast in the summer. Tagging the turtles is the most logistically difficult part of the process. The Massachusetts researchers use the expert eyes of George Purmont, a spotter pilot, to find the turtles. Then, they go out with commercial fishermen — most often a Harwich lobsterman named Mark Leach — to catch and tag them. Using a specially designed net that is so heavy when sopping wet that Dodge can barely lift it, they collect the turtles, maneuver them on to a specially designed ramp, and tug them on board. It sounds easier than it is. Once on board, the turtles are free to explore. The researchers learned early on that restraining a giant sea turtle wasn’t going to be practical or safe, so they removed anything harmful from the deck and let the turtles move around as they please. They draw blood to check the health of the turtle and tag it when it rests. The tag, affixed to the central ridge bone of the turtle’s shell, communicates with satellites and transmits the turtle’s location, the depth at which it is swimming, and the local water temperature. The tags are attached by tethers that disintegrate in a year. Dodge said she hopes to continue her work this summer with different sensors that last for a shorter time but report back finer detail about the turtle’s position and location, and even include a camera. That should allow scientists to better understand turtles’ feeding behaviors. Paradoxically, she said, the toughest part of turtle tagging is getting them to go back in the water. Then, the science begins.